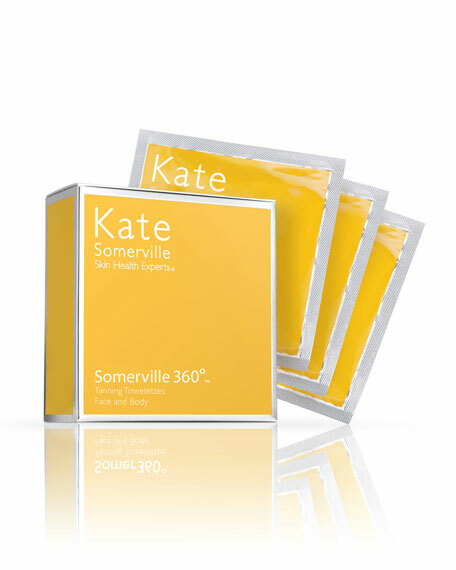 Kate Somerville shows you how to use the Somerville 320 Tanning Towelettes. Each Somerville360° Towelette is concentrated with a paraben-free self-tan formula to give you a quick and even application with no streaking. Dries within seconds of application. Doesn't give you orange color. Melaleuca Alternigolia (Tea Tree) Leaf Oil is anti-bacterial. Cucumber Fruit Extract is calming. Vitamin C and E antioxidants are soothing. Includes box of 8 individual towelettes.